Along with learning the accompaniment and vocal lines, I have spent time comparing Purcell's The Fairy Queen to Shakespeare's play A Midsummer Night's Dream on which the opera is adapted. An intensive summer doing nothing but opera could not sound more appealing to me, since all I do in whatever spare time I have is playing or singing through operas! This program was recommended to me by many of my friends saying that it is a must for any aspiring répétiteurs, and I cannot pass up this opportunity to work with some of North America's finest teachers and coaches. Aya Robertson started playing piano at the age of three, and by the the age of 16, she had completed both her ARCT Diploma (Piano Performance First Class Honors) from the Royal Conservatory of Music and her LLCM Diploma (Piano Performance) from the London College of Music in England. To boot, in 2014, she won first prize in the Vancouver Young Composers Competition for her original orchestral score which premiered at the Orpheum Theatre in Vancouver. In 2018, Aya attended the prestigious Mozarteum Internationale Sommerakademie in Salzburg, Austria where she studied under concert pianists Robert Levin and Andrea Bonatta. While there, she studied with and accompanied singers, violinists, and cellists. In the same year, Aya enrolled at the Victoria Conservatory of Music Baroque Oratorio Programme where she studied Harpsichord and Continuo playing with Steven Devine and David Stratkauskas. 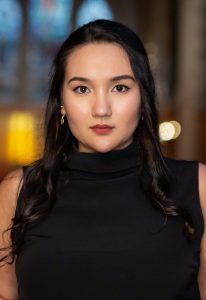 This summer, in addition to the Opera NUOVA Young Artist program, Aya will be attending Orford Musique Summer Academy as a duo with soprano Kyla Fradette. Their instructors will be Francis Perron and Benjamin Butterfield. Aya is currently completing the final year of her Bachelors of Music at the University of Victoria. Her major is piano with an emphasis on vocal accompaniment and coaching. Her instructors include Rebecca Kelly and Bruce Vogt for solo piano and Kinza Tyrrell, Benjamin Butterfield, and Csinszka Rédai for repetiteurship training.